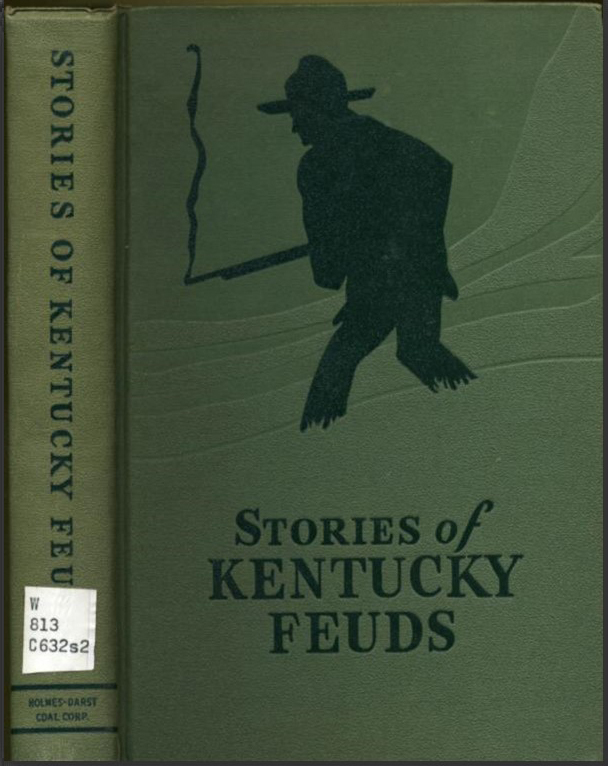 Blog post by Stewart Plein, Rare Book Librarian. This post originally appeared on the Books Tell You Why blog. 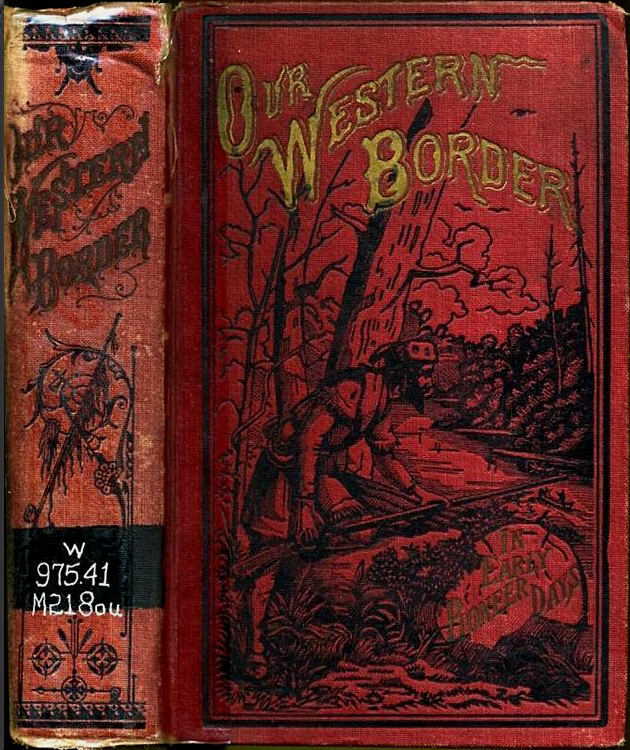 The great frontier hero, Daniel Boone, on the cover of McKnight’s Our Western Border, shown above, is surrounded by a complex wilderness. In this design Boone carefully leans over a mountain cliff, looking down to the river below, watching Indians canoeing upstream. He is pictured as a competent woodsman and explorer, living life free, without restraint, in verdant forests filled with danger. It was a time idealized by the book. 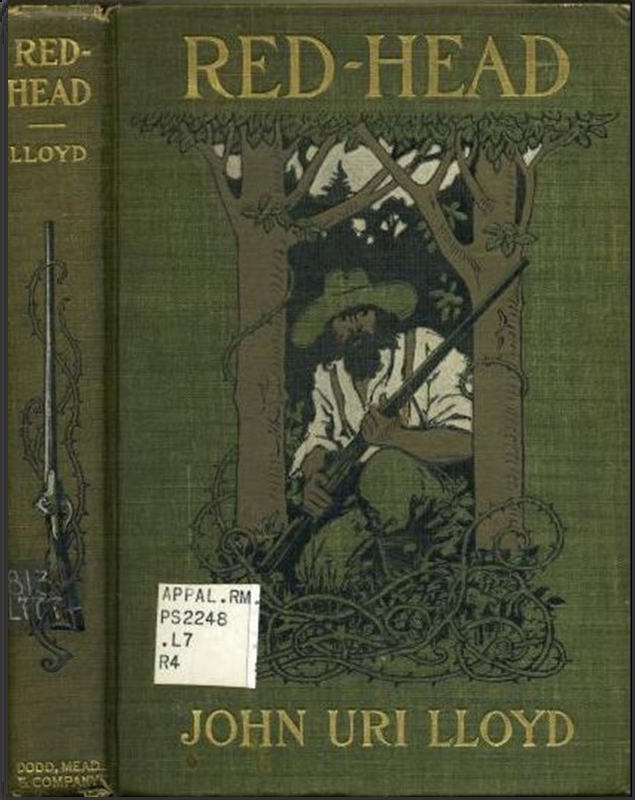 The rugged mountaineer on the cover of Lloyd’s Red Head, (1903) above, crouches with his rifle at the ready. Is he expecting trouble? Is he lying in wait for an ambush? To know the answer to these questions we must read the book. 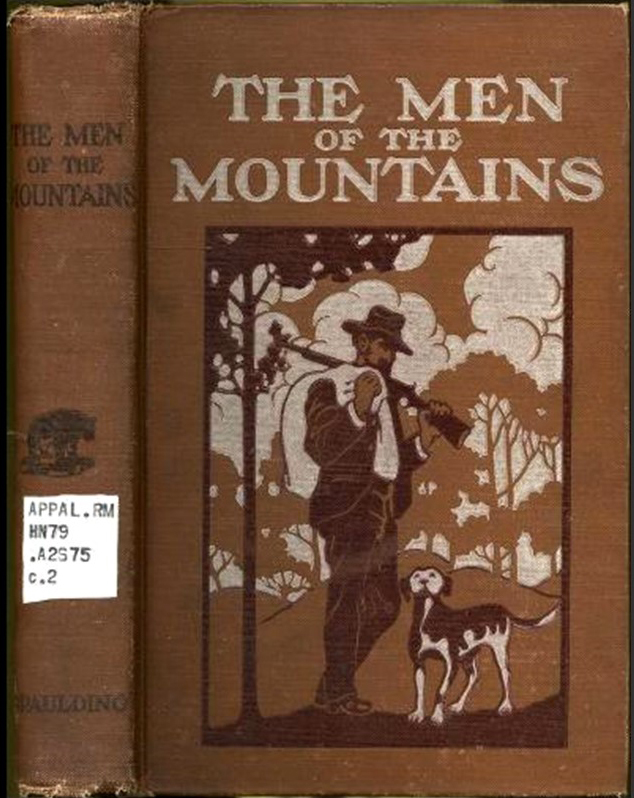 The cover draws us in, but no longer is the mountain man shown as master of the wilderness. His depiction has changed to one of an outlaw, rather than a pioneer. 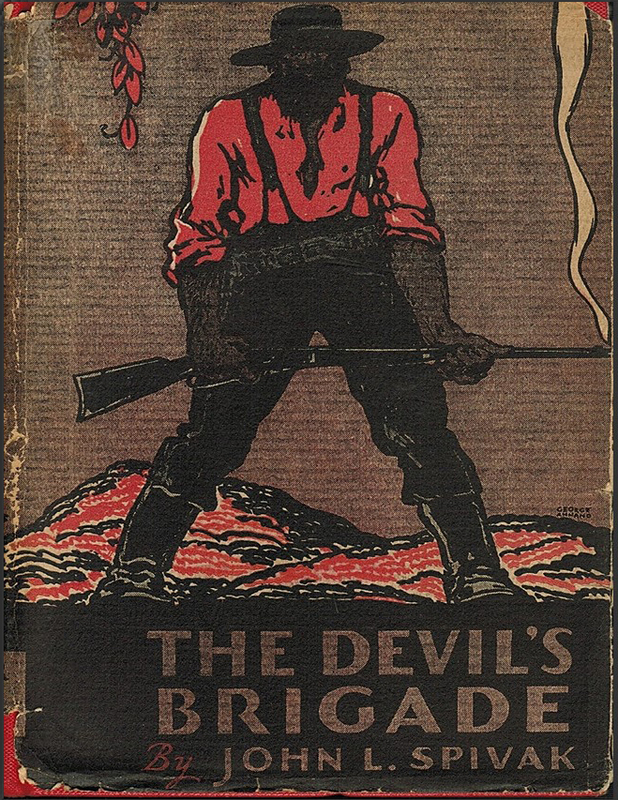 The design of the book cover is the first tool used to draw us in, to convey some idea of the story itself, and it provides clues to the pervasive ideas of turn of the century culture and attitudes. The mountain man, although depicted here as a hunter, is not shown in command of the wilderness, but as a hunter/gatherer/provider. 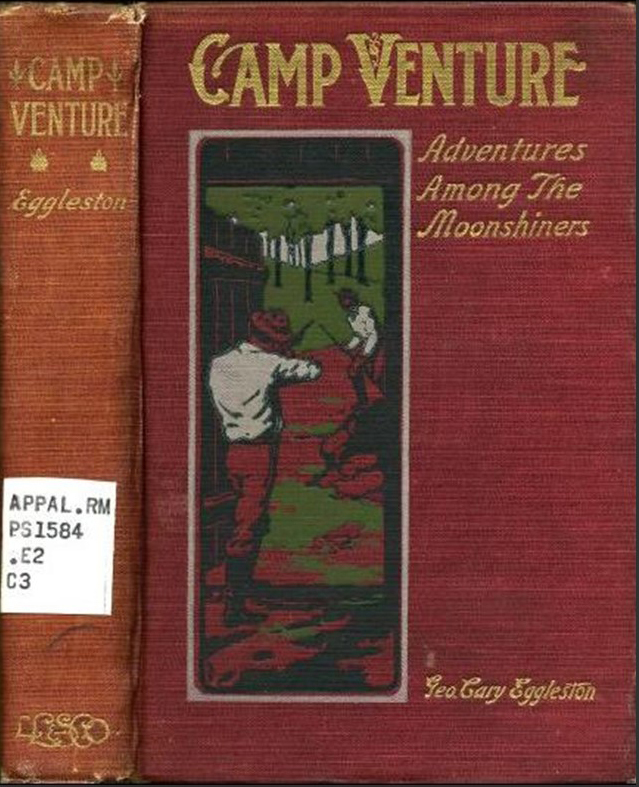 The mountaineer on this cover returns at the end of the day with a full sack, a gun over his shoulder, and his dog by his side (below). The rising smoke of a recently fired rifle is the key to these images, below. To the world outside of Appalachia the feud is now recognized as the only form of mountain justice. Ever on the lookout, the mountain man is seen protecting his still from advancing revenuers, below. Editor’s Note [from Books Tell You Why]: Many thanks to Stewart Plein for her insightful post and for sharing it with the Books Tell You Why community. Below, please find a list of the books shown above (in order of appearance), as well as links to a journal article published by Ms. Plein which she used as reference for this post. If you have questions or thoughts about this topic, leave her a comment! Spivak, John Louis. 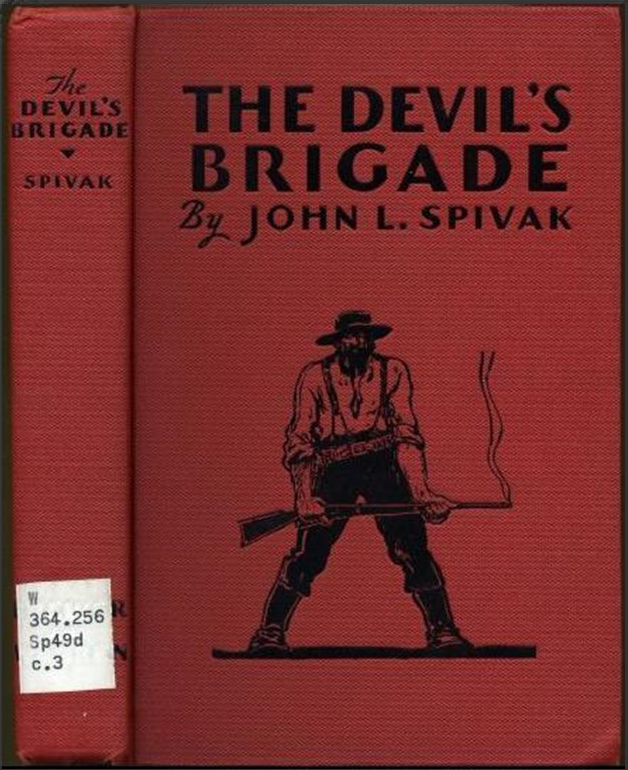 The Devil’s Brigade; The Story of the Hatfield-McCoy Feud. NY: Brewer and Warren, Inc., 1930. Early scientific journals were the private notebooks of scientists. 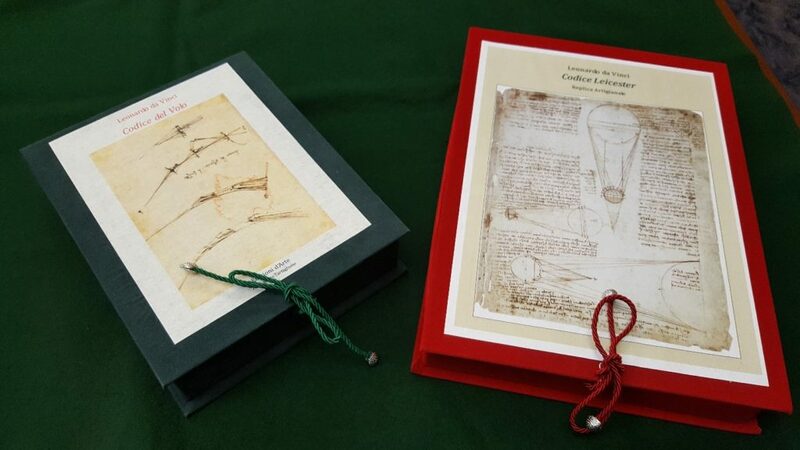 Luxurious replicas of two notebooks by 15th Century Italian artist, mathematician, inventor and writer Leonardo da Vinci are available to examine in the WVU Libraries Rare Book Room. Leonardo wrote in Italian and using mirrored writing, writing backwards from right to left and illustrating with drawings. The notebooks contain his observations and brainstorming on multiple subjects in text, diagrams, and illustrations. Blog post by Stewart Plein, Rare Book Librarian. I thought Rush Dew Holt, Sr. would be a fitting blog post subject, considering our upcoming elections. (Remember to vote on November 8!) 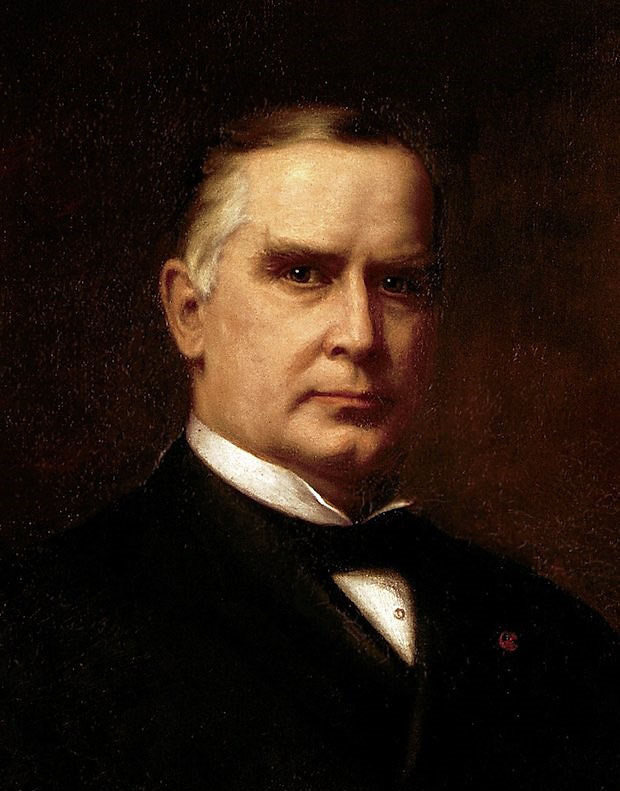 Holt is generally credited with being the youngest popularly elected senator in the U.S. Senate. However, that does not mean he was the youngest senator—depending on what you read, he is cited as being fourth or fifth youngest. These gentlemen actually joined the Senate under the radar, since they all broke the rule that Senators must be 30 years old (U.S. Constitution, article 1, section 3, clause 3). A piece of Holt campaign ephemera—he looks so young! From highways to buildings and even a giant radio astronomy telescope, U. S. Sen. Robert. C. Byrd left his mark on West Virginia. The eloquent Byrd, the only U. S. Senator to work his way through law school while in office, often held his pocket Constitution high as he argued for it, not the emotion of the day, to rule Senate votes. Byrd died in 2010 while still in office. A traveling exhibit chronicling his life opens November 10 in the West Virginia University Libraries’ Rockefeller Gallery. 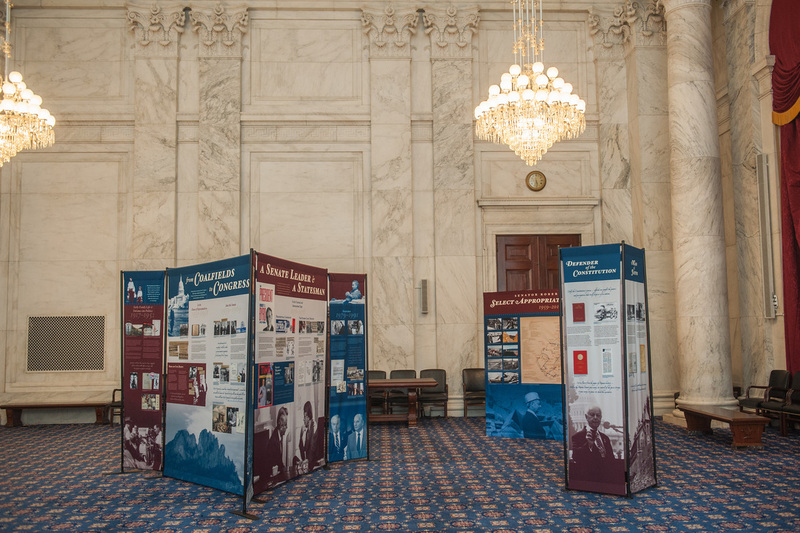 A reception, to be held from 4:30 p.m. to 6 p.m., will include remarks from Dr. Raymond Smock, director of the Robert C. Byrd Center for Congressional History and Education, as well as David A. Corbin, former aide to Senator Byrd and author of The Last Great Senator. The Byrd Traveling Exhibit on display in the Kennedy Caucus Room of the U.S. Senate, photo provided by the Byrd Center. West Virginia University students, faculty and staff will now have access to an array of unique resources from more than 110 academic institutions from around the globe through an agreement between WVU Libraries and HathiTrust. HathiTrust is a partnership of academic and research libraries collaborating to preserve and provide digital access their institutions special collections. The group draws its name from the Hindi word for elephant, hathi, symbolic of the memory, wisdom and strength evoked by the animal, as well as the huge undertaking of gathering prized resources from research libraries around the world. October is the primary season of harvest. 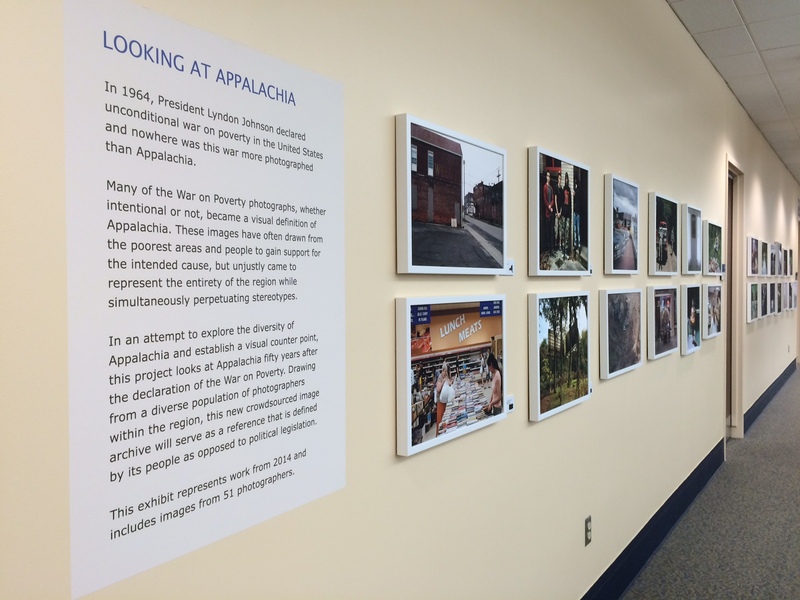 The photograph collection at the West Virginia and Regional History Center includes many historical images that document this seasonal activity around the state. Harvesting a field in Monongalia County, undated. The WVU Libraries’ Veterans Outreach Program (WVUL-VOP) is hosting a luncheon program for student veterans on Friday at noon in the Downtown Campus Library, Room 2036. The talk, entitled “Mindfulness 101,” is geared toward student veterans and will provide an introduction to mindfulness and offer personal applications for the practice. The guest speaker is a physician and veteran. Dr. Michael Brumage, MD, MPH, FACP, is the executive director/health officer for the Kanawha-Charleston Health Department. He served in the U.S. Army for more than 20 years. November is Mindful Mountaineers Month at WVU. This program will be a preview of the special events that are coming up each day in the month ahead. For more information, contact Carroll W. Wilkinson, director of Strategic Library Initiatives at WVU Libraries, at cwilkins@wvu.edu or 304-293-0308. This year, 2016, marks the 50th anniversary of the iconic science fiction TV show, Star Trek, which debuted in 1966. Today, following an unprecedented series of spin offs, the first Star Trek is referred to as TOS or The Original Series. 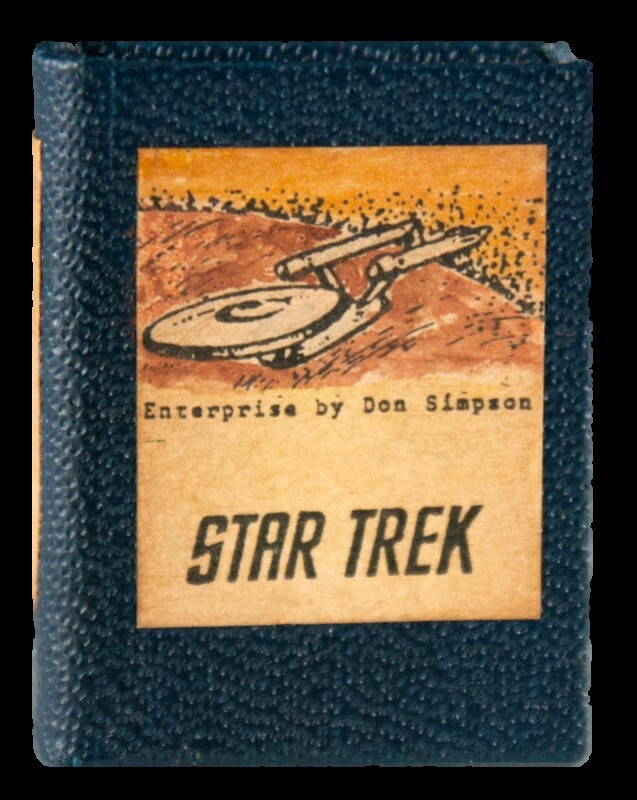 To celebrate Star Trek’s 50th anniversary I would like to share with you a new acquisition to the Rare Book Room in the West Virginia and Regional History Center, a miniature book titled Star Trek: A Television Series, 1966-69. By Danielle Emerling and Jane LaBarbara, Assistant Curators at the West Virginia & Regional History Center. Reposted from Archiving West Virginia. October is American Archives Month, and for the first time, archives in our state are collaborating to celebrate “West Virginia Archives Month.” Archives from around the Mountain State will contribute blog posts to this site, host events, and invite everyone to visit and experience the rich history and culture of our state. 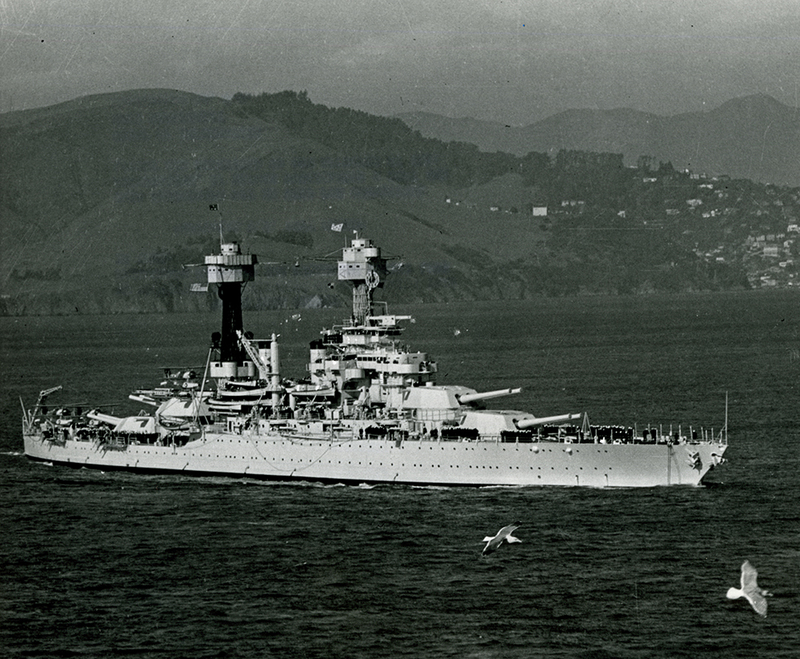 West Virginia University Libraries’ West Virginia & Regional History Center has released more than 1,500 digital photographs from the Senator John D. Rockefeller IV archives. Available from the Libraries’ website, the photographs document many significant moments from Rockefeller’s 30 years in the U.S. Senate. The images, taken by the Senate Photographic Studio, begin with the Senator’s first swearing-in ceremony in January 1985 and help tell the story of his many contributions in the U.S. Congress. The photographs capture the Senator through the years speaking at press events, presiding over committee hearings, and attending functions on Capitol Hill. He was photographed with policy leaders, business directors, and many of his congressional colleagues. 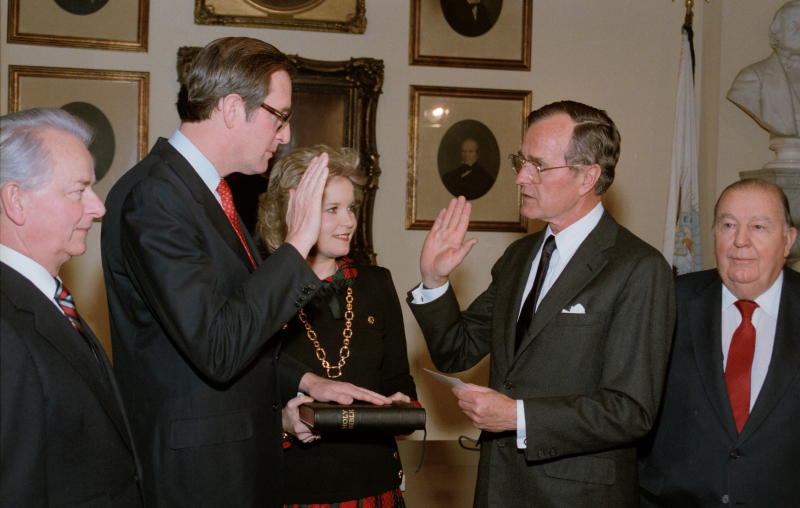 Vice President George H. W. Bush administering oath to Senator John D. (Jay) Rockefeller. Rockefeller is joined by his wife, Sharon, Senator Robert C. Byrd and former Senator Jennings Randolph, whom he succeeded. Senate Photographic Studio, January 15, 1985. Representatives from the U.S. Patent and Trademark Office will visit West Virginia University on Thursday, Sept. 29, and Friday, Sept. 30, to provide training on patents and trademarks. WVU Libraries and the Health Sciences Innovation Center will co-sponsor the program on Sept. 29, 9:30 a.m.-5:30 p.m., at the Evansdale Library. Sessions will include an introduction to intellectual property, hands-on training for patent and trademark searches, and a panel discussion on services available at WVU for inventors. West Virginia University’s Downtown Campus Library will host a reception Saturday, Sept. 17, 1-3 p.m. for two exhibits designed to create conversations about life in Appalachia. Looking at Appalachia is a juried collection of images by amateur and professional photographers directed by West Virginia native Roger May. It chronicles life in the 13-state region more than 50 years after President Lyndon Johnson’s War on Poverty. 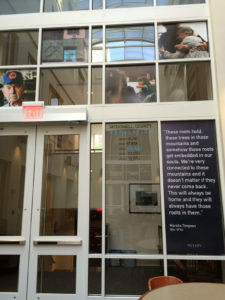 The pictures line three walls on the Library’s first floor. Looking at Appalachia provides a glimpse into the 13-state region, photo by Alyssa Wright. Hollow is an award-winning web-based interactive documentary created by WVU alumna and state native Elaine McMillion Sheldon. It examines the issues facing McDowell County residents and the reasons behind the massive exodus from the area over several decades. Hollow won a Peabody award in 2013 and was nominated for an Emmy in 2014. An exhibit in the Downtown Campus Library Atrium showcases the participatory project. 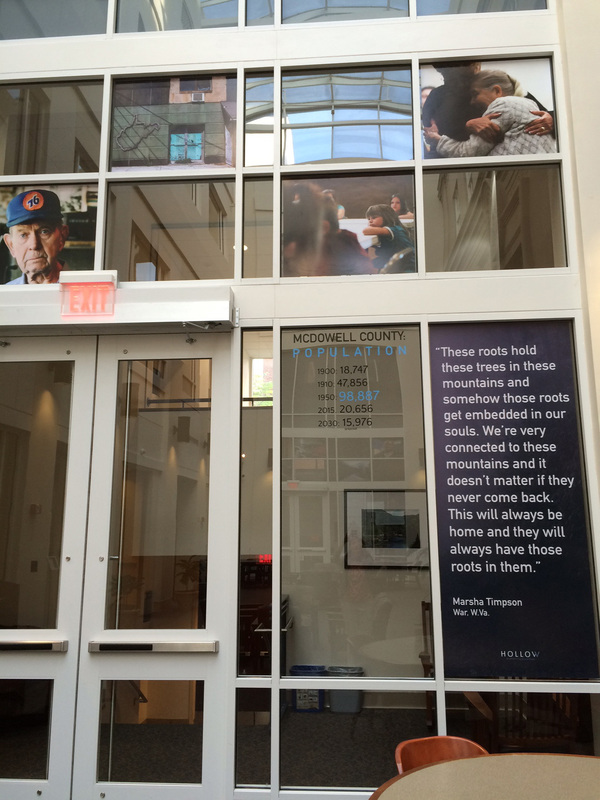 Images from the documentary Hollow adorn a wall in the Downtown Campus Library Atrium, photo by Alyssa Wright. Blog post by Jane Metters LaBarbara, Assistant Curator for Archives and Manuscripts, and Anna Schein, Associate Curator for Printed Ephemera, WVRHC. During colonial times, agricultural products were stored and transported in heavy wooden barrels or boxes. By the mid-1850s, cotton bags became the preferred method of transporting flour, sugar, seed, animal feed, and fertilizer. Especially in rural communities, these bags, commonly known as feed sacks, were reused to make clothing, curtains, sheets, towels, quilts and more. (To see a fantastic example of a feed sack dress, take a look at this dress made for the 1959 Cotton Bag Sewing Contest, preserved by the National Museum of American History.) Company logos printed on the bags with water soluble inks could be removed by soaking the bags in a combination of lye, soap, and bleaching agents. By the end of the 1950s, almost all of the products previously packaged in cotton bags were sold in paper or plastic sacks which were cheaper to produce and considered more sanitary. The S. George Company in Wellsburg, West Virginia printed company logos on paper flour barrel labels and paper flour sacks by using metal and wood engravings. Amazingly, many of these engravings survive today and are preserved in the GramLee Collection, curated at WVU’s College of Creative Arts. 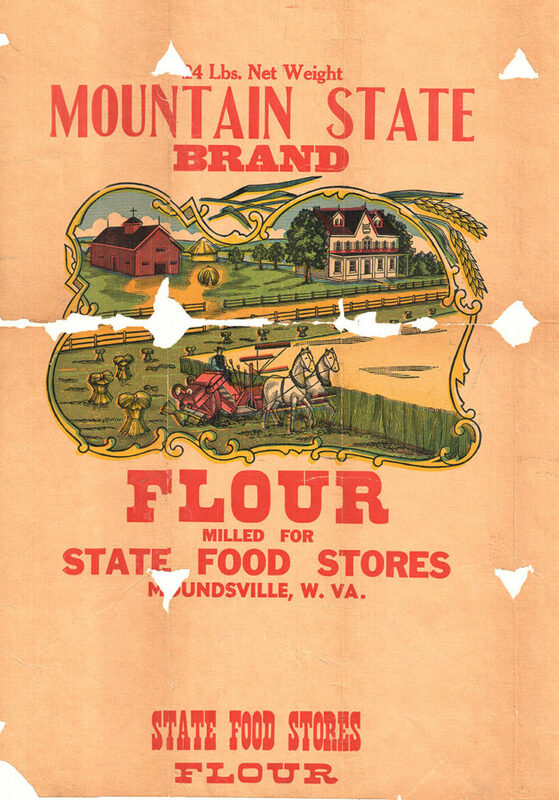 Some S. George Company flour sack proofs made for West Virginia mills and businesses are now in the WVRHC’s A&M 3868. Are you frustrated by the price of textbooks? The Downtown Campus Library is looking for 10 students to participate in a discussion about textbook prices and alternatives on Sept. 7. The College Board estimated that the average undergraduate paid $1,225 for textbooks and supplies in 2014–15. Experts from the University of Minnesota’s Open Textbook Network will be on campus and we would like to give students an opportunity to talk about how the cost of textbooks affect them. When: Wednesday, Sept. 7, 5-6 p.m. If you have a story to tell, please sign up here. Space is limited to 10 students. Dinner will be provided for all participants. If you have questions, please contact Genifer Snipes, chair of the WVU Libraries Open Educational Resources Committee, at 304-293-4240 or genifer.snipes@mail.wvu.edu. This focus group is sponsored by WVU Libraries.